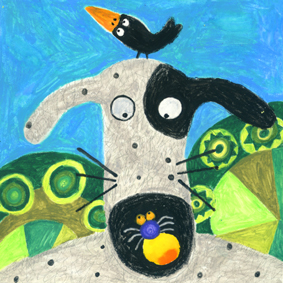 One day a dog, Jojo, and his friends go to an owl Jack's home. Jack begins to talk about what happened at a cold midnight just one year ago in winter. The story is that he heard the tinkling of a bell from a distance and saw something flying over the sky that did not look like a bird. Curious Jojo and his friends are strongly interested in Jack's story and want to see who else besides birds can fly in the sky. They realize that birds are not able to see anything in the darkness at all. Jojo gets an idea that an insect that emits light from the hips might be able to make the darkness bright at midnight. and then wait for something coming by from the sky. When they hear the tinkling of a bell from a distance, they set loose the insects to the sky. What a fabulous shiny yellow tree! Something flying comes close to where Jojo and his friends are waiting for. Jack begins to talk about what happened at a cold midnight just one year ago in winter..
Jojo gets an idea that an insect that emits light from the hips might be able to make the darkness bright at midnight. Jojo and his friends try to catch the insects.